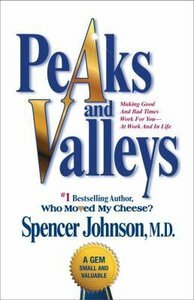 Making Good And Bad Times Work For You -- At Work And In Life^"Peaks and Valleys" is a story of a young man who lives unhappily in a valley until he meets an old man who lives on a peak, and it changes his work and life forever.^Initially, the young man does not realize he is talking with one of the most peaceful and successful people in the world. However, through a series of conversations and experiences that occur up on peaks and down in valleys, the young man comes to make some startling discoveries.^Eventually, he comes to understand how he can use the old man's remarkable principles and practical tools in good and bad times and becomes more calm and successful himself.^Now you can take a similar journey through the story and use what you find to your advantage in your own work and life. - Publisher Spencer Johnson, M.D., is one of the world's most respected thinkers and beloved authors.His eleven international bestselling books include the #1 titlesWho Moved My Cheese?An A-Mazing Way to Deal with Change,the most widely read book on change, and The One Minute Manager, the world's most popular management method for over two decades, coauthored with Kenneth Blanchard.Dr. Johnson is often referred to as ?the best there is at taking complex subjects and presenting simple solutions that work. ?He recieved a B.A. degree in Psychology from the University of Southern California, an M.D. degree from the Royal College of Surgeons, and performed medical clerkships at the Mayo Clinic and the Harvard Medical School.He has served as Leadership Fellow at the Harvard Business School, and is currently Advisor to the Center For Public Leadership at Harvard's John F. Kennedy School of Government.His work has captured the attention of major media, including the Associated Press, the BBC, CNN,Fortune, theNew York Times, theTodayshow,Timemagazine,USA Today, and United Press International.More than forty-six million copies of Spencer Johnson's books are in print worldwide in more than forty-seven languages. Spencer Johnson, M.D., is one of the world's most respected thinkers and beloved authors.His eleven international bestselling books include the #1 titlesWho Moved My Cheese?An A-Mazing Way to Deal with Change,the most widely read book on change, and The One Minute Manager, the world's most popular management method for over two decades, coauthored with Kenneth Blanchard.Dr. Johnson is often referred to as ?the best there is at taking complex subjects and presenting simple solutions that work. ?He recieved a B.A. degree in Psychology from the University of Southern California, an M.D. degree from the Royal College of Surgeons, and performed medical clerkships at the Mayo Clinic and the Harvard Medical School.He has served as Leadership Fellow at the Harvard Business School, and is currently Advisor to the Center For Public Leadership at Harvard's John F. Kennedy School of Government.His work has captured the attention of major media, including the Associated Press, the BBC, CNN,Fortune, theNew York Times, theTodayshow,Timemagazine,USA Today, and United Press International.More than forty-six million copies of Spencer Johnson's books are in print worldwide in more than forty-seven languages.